This week we will observe Thanksgiving Day in the United States of America—a day when family and friends gather for a time of celebration and feasting. Soon your turkey and stuffing will be in the oven and pleasant aromas will fill the kitchen. Before we begin our celebration, let’s take a peak back four centuries ago when Americans celebrated their first Thanksgiving. For 66 days a sailing vessel called the Mayflower carried 102 pilgrims across the stormy Atlantic Ocean and landed at Plymouth Rock in Massachusetts on December 11, 1620. During that first cold winter, 46 pilgrims died. In the spring of 1621, the Wampanoag Indians taught the pilgrims how to cultivate the land—growing corn, beans, and pumpkins which helped them survive. At harvest time the colonists were so grateful for their bountiful crops that Governor William Bradford organized the first Thanksgiving feast, inviting their neighbors—Wampanoag Indians. With joy and thanksgiving, they expressed their gratitude and appreciation to God for their bountiful harvest. So it has been that for over two centuries. 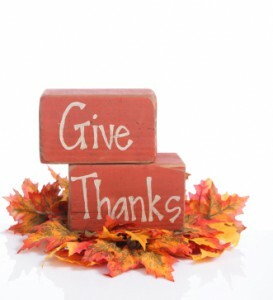 Thanksgiving Day has become a joyous festival celebrated with a lot of enthusiasm. People have gathered together to thank God for His past blessings and to enjoy the warm fellowship of family and friends. However, over the last 50 years Thanksgiving Day has lost its original significance. For many people, it has simply become a time when families come together to eat turkey and watch football. As we prepare to celebrate this Thanksgiving with our family and friends, I encourage you, regardless of where you live in the world, to stop and reflect on the things for which you are grateful. When we focus on all the positive things in our lives, we will find more joy, satisfaction, and happiness. Our lives will take on greater meaning and our hearts will be filled with love and gratitude. 1. Make a list of all the things for which you are thankful. Stretch yourself to make a list of 50 people, things, or events. This can include the names of family, friends, co-workers and others whose relationships you value. Include your religious affiliations, your pastor or priest. Include our country and the servicemen who are protecting our land and our rights. It can also include your physical being, material possessions, and conveniences we so often take for granted. Parents, let me encourage you to have your children participate in this exercise. 3. Express your gratitude to the people you’ve listed. It could be a hand-written note, a personalized email, a text message, or a phone call. Whatever method you choose to use, make it personal and heartfelt. Let these people know how you feel about them and how special they are to you. If the weight of your challenges makes it difficult to give thanks, reflect back how the pilgrims must have felt. “The Pilgrims made seven times more graves than huts. No Americans have been more impoverished than those who, nevertheless, set aside a day of thanksgiving.” H. U. Westermayer. Don’t take anything you have for granted. Instead express your gratitude for all your many blessings—great and small. We’d like to hear from you. Please share your comments below. What are some hidden blessings that you have recently become aware of? Have you come to appreciate something that you took for granted in the past? Have you come to appreciate a person whom you took for granted in the past?